M. Aemilius Scaurus was Aedilis Curulis in 58 BC, and struck coin in that respect. He was Praetor in 56 BC and Proparaetor of Sardinia in 55 BC. He was the son of Marcus Aemilius Scaurus and Caecilia Metella Dalmatica. Scaurus lost his father when he was very young, but his education was insured by several other family friends. Pompey the Great was briefly married to his sister Aemilia Scaura and, even after her death, Pompey continued to take personal interest in the young man. During the Third Mithridatic War, Pompey asked for Scaurus by name to become his military tribune, and charged Scaurus, at the time quaestor, with the responsibility for the Judea region, which was involved in a bloody civil war between the brothers Hyrcanus and Aristobulus. 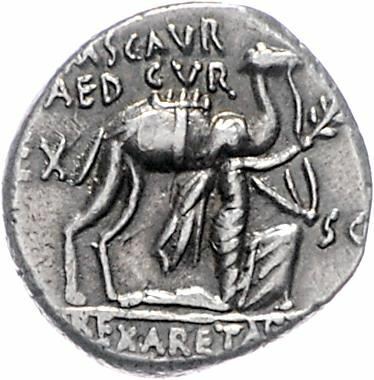 Scaurus was supported by the First Triumvirate for the consulship in 54 BC, but was accused of extortion in his province. He was defended by Cicero, and acquitted in spite of his obvious guilt. In 53 BC, however, he was accused of ambitio (shameless bribery) and went into exile.